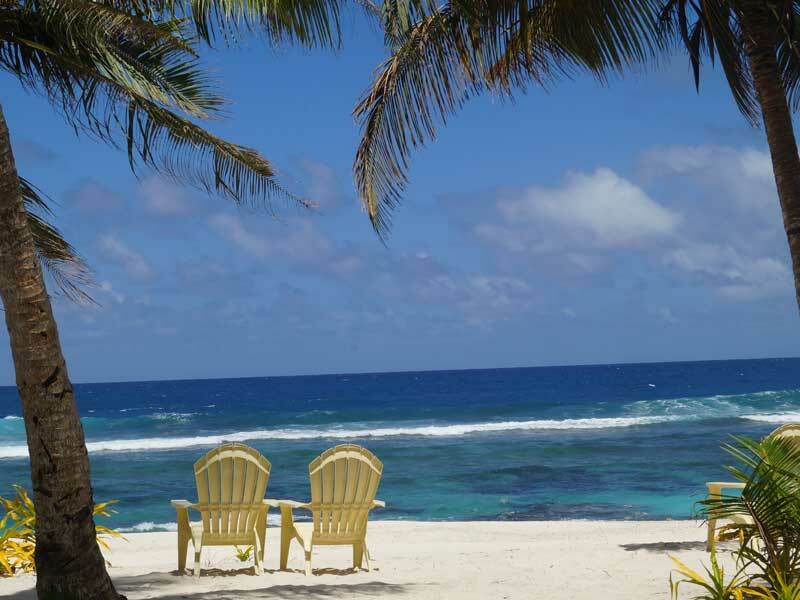 This resort sits beside the picturesque white sand beach and has an interesting history dating back to the 1953 movie Return to Paradise starring Gary Cooper. 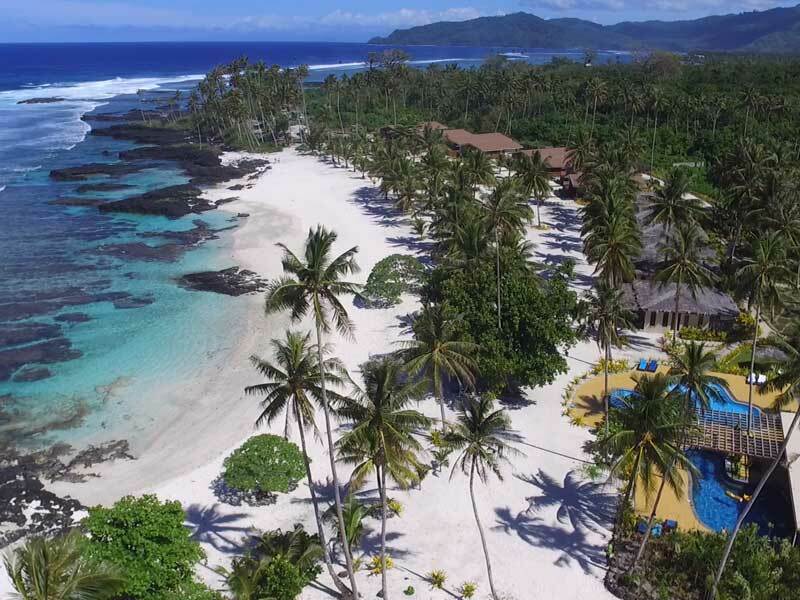 Since that time the beach and surrounding land has been owned and cared for jointly by local Samoan families who eventually decided to create this resort. This modern resort is still locally owned and staffed by the extended family members. This is a destination where you can experience traditional Samoan culture and get some insight into how this friendly and welcoming community live. The resort has just 60 rooms, villas and suites in a variety of sizes and sleeping configurations. This makes it a more intimate resort, with no crowds and never any hustle and bustle. There are several excellent dining options available at the resort. Paradise Kitchen is the signature restaurant with a menu featuring international cuisines created with the freshest local produce. Cabana Café is open through the peak season and features a range of light meals and snacks, while the Rock Pool Bar has a fantastic location near the beach and is a great socialising spot where you can try a local Samoan beer, a wine from the cellar or a delicious cocktail. The amazing wide sandy beach provides endless hours of activities and fun and there’s plenty of room for everyone, so don’t expect to be crowded. If you want a change from the beach and ocean, the resort has 3 outdoor pools that have plenty of shady spots to relax, sip on a cool drink and forget about your worries. Sparadise Day Spa is a tranquil retreat that offers a pampering experience with a selection of traditional massages and beauty treatments for guests. 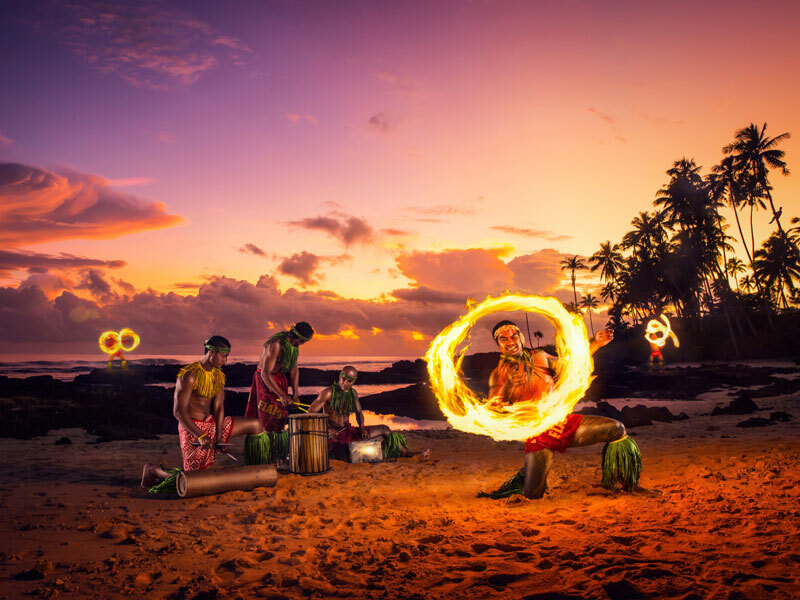 The resort runs weekly cultural nights, where you can enjoy some traditional Samoan entertainment, learn authentic crafts and experience the rich 3000-year old history of the island. Why Go to Return to Paradise Resort? 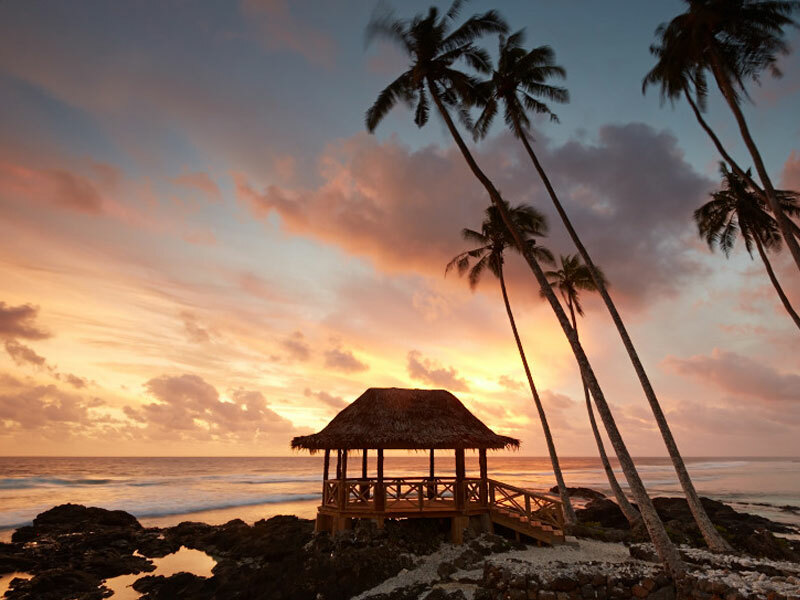 Visitors to this locally owned and operated resort have a unique chance to experience the authentic Samoan lifestyle up close. With the excellent service given by the friendly and welcoming staff, plenty of activities to try and first-rate accommodation on offer, there is something here to suit everyone. 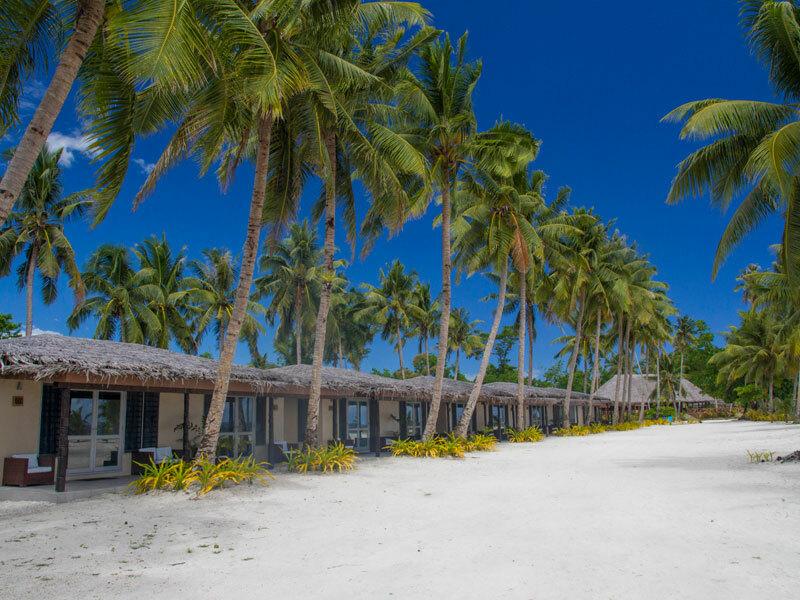 Surrounded by natural forest and manicured gardens on one side and the white sand beach on the other, the location of this resort is perfect for your next Samoan getaway. 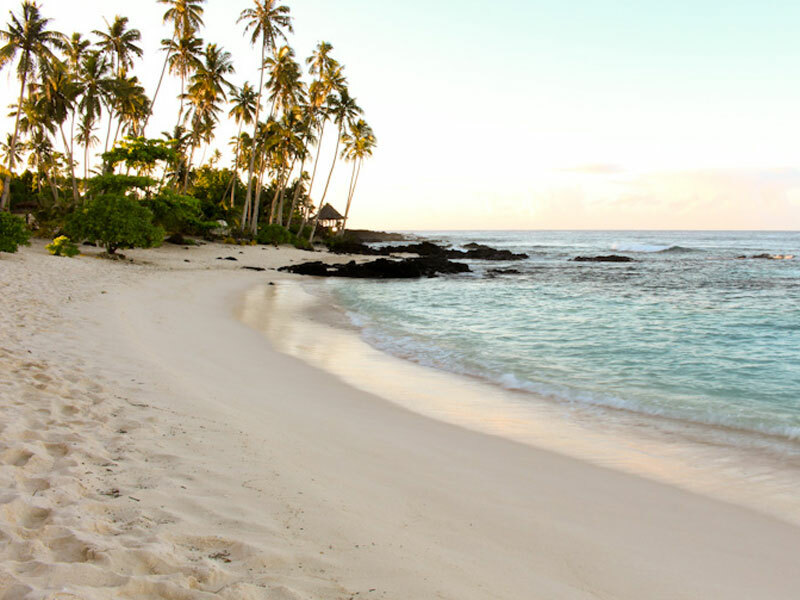 If this sounds like your perfect holiday to Samoa, give us a call now on 1300 000 753! Surrounded by the landscaped tropical gardens and close to the pool and resort amenities, this room has a spacious feel and comfortable style. Splashes of colour liven the place and the large sliding door allows the natural light to flow in. The sliding door opens to your private balcony, a great spot to sit and enjoy Samoa’s warm weather and cool breezes blowing in from the ocean. The room has 35sq. metres of space and comes with a Queen-size bed and an additional Single bed if required, meaning the room can sleep up to 3 guests. The room is air-conditioned and has ceiling fans, a TV with cable channels, mini refrigerator and tea and coffee making facilities. Step out through your huge floor-to-ceiling glass doors and you are on the pristine sandy beach. This room is set amongst the palm trees and has a traditional thatched roof that looks perfect in the beach setting. The handmade rock wall in the bathroom is a nice feature and adds some additional character to the room. With a generous 30sq. metres of space, the room feels spacious and refreshing with plenty of natural lighting. There is a King-size bed that can be split into 2 Single beds if desired. The room has air-conditioning, facilities to make tea and coffee, a TV with cable channels and a mini refrigerator. This beautiful 1-bedroom suite sits right on the beach, with the ocean just metres away. Your private balcony has stunning views of the sparkling blue water and is a wonderful spot to unwind with a cold drink. The suite has a separate living/dining area that also has a kitchenette, so you have plenty of space to enjoy. The suite comes with a King-size bed and a rollout Single bed is available on request. You also have the use of a mini refrigerator, TV with cable channels and air-conditioning for those extra warm days or nights. This absolute beachfront suite features a clean and modern design with a feeling of relaxed luxury. At 60sq. metres in size the suite is ideal for 2 guests and even with a full King-size bed, still feels very spacious. The stunning beach is literally right outside your door and you have wonderful ocean views to enjoy. There is a furnished outside verandah and deck area, your own private plunge pool and a deluxe bathroom with handmade rock wall. If you want some relaxation time in your suite, it comes with air-conditioning, a TV with cable channels and DVD player and Wi-Fi. Each of the large bedrooms in this villa has an ensuite for your convenience and features a King-size bed that can be split into 2 Single beds. The villa is a generous 93sq. metres in size and has a dining and living area with a kitchenette and an outdoor lounge deck with comfy sun lounges. The beautiful tropical gardens surround the villa and remind you of the natural beauty of this island nation. If you need a break from the warm weather, the villa has air-conditioning throughout and you can relax with the TV with cable channels and in-room Wi-Fi. With lovely views of the beach and the turquoise water beyond, this spacious villa features 2 large bedrooms, each with a King-size bed, a separate living/dining area and a functional kitchenette. The furnished patio gives you outdoor living space and is an enjoyable spot to unwind. The villa has a TV with cable channels, a mini refrigerator and tea and coffee making facilities. The air-conditioning is great for creating your own cool oasis, or you might prefer just to use the ceiling fans. 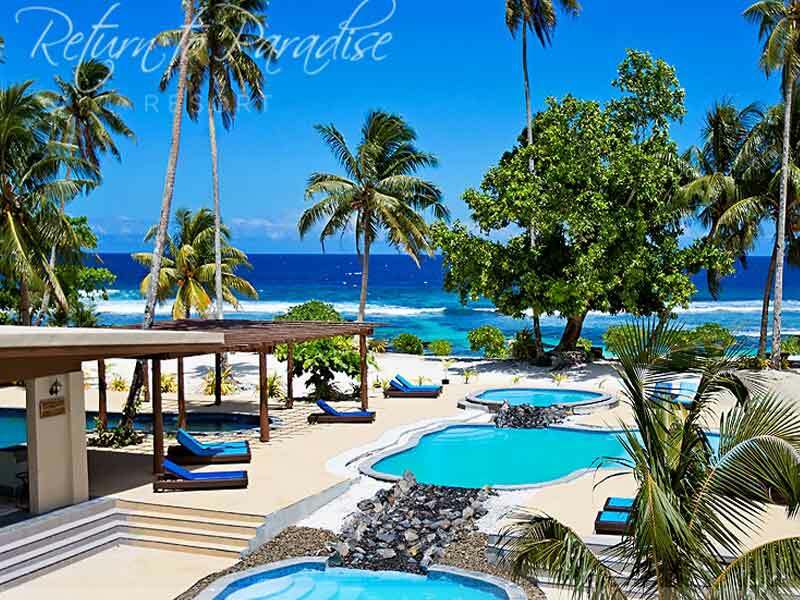 You’ll find Return to Paradise Resort and Spa right on the beach along the south-west coastline of Upolu. If you’re coming from the international airport it’s just a 30-minute drive to get to the resort. The property boasts a secluded and peaceful feel but has every amenity you could want and is close to local villages and shops. 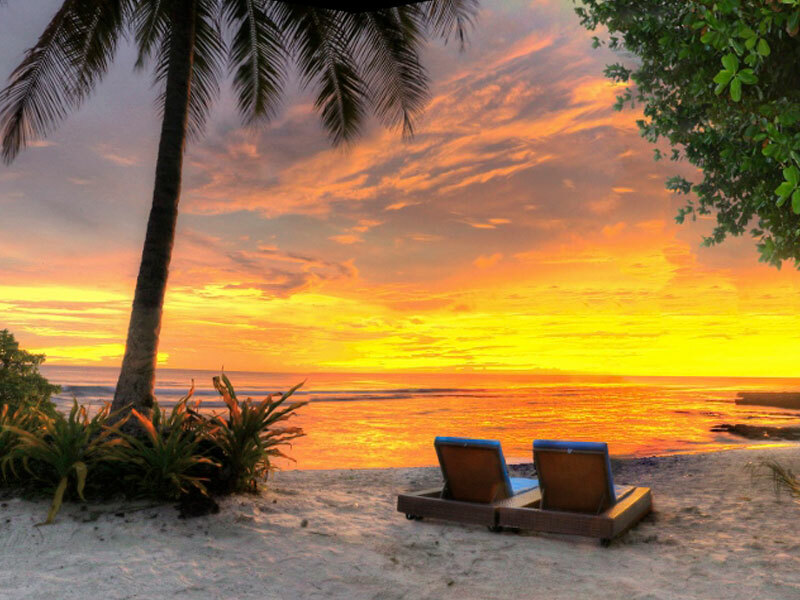 The entire southern coastline of Upolu has some wonderful attractions to visit and this resort makes a great base for hiring a car and visiting some of Samoa’s best sights. The resort organises regular activities for guests to try, so you’ll never be short of things to do. The private beach is great for volleyball and the ocean is ideal for swimming and is also excellent if you want to try snorkeling. If you want to explore the wider local area you can take a kayak or snorkeling tour of the Giant Clam Reserve that is cared for and protected by the local village. There is also a walking trail through the village and school – this is a fantastic way to get some first-hand experience of the Samoan way of life. Visit spectacular waterfalls and pristine freshwater swimming holes nearby. If you enjoy fishing, some of the locals offer a reef fishing trip that you will love. For something more festive and relaxing, you can take part in a traditional Samoan beach BBQ, where the absolute freshest produce will be cooked using a time-honoured BBQ method. The location, beach, facilities, staff, food and even the other guests we met were all outstanding. This was our 3rd trip to Samoa and this resort was clearly the best we have stayed at. We will most certainly be returning their next time we go to Samoa.